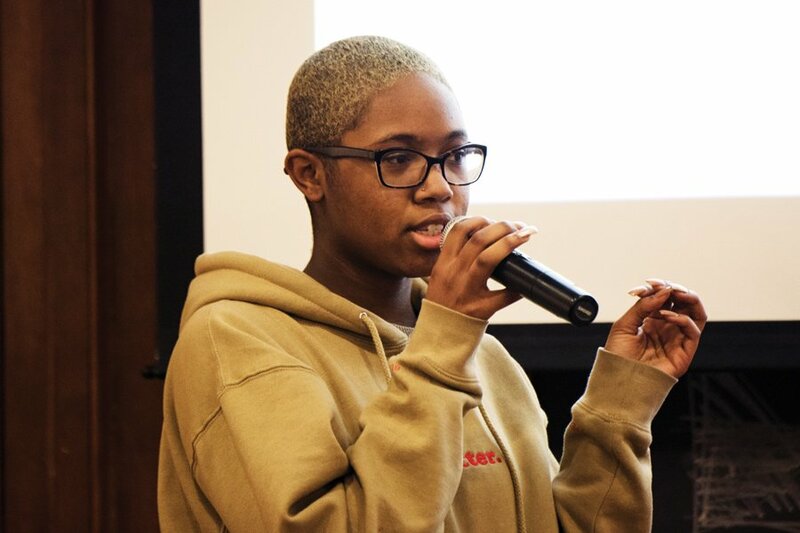 Medill first-year Imani Harris speaks at a town hall on Wednesday held to discuss the presence of controversial visiting scholar Satoshi Kanazawa at NU. The students at the town hall presented demands for the University and strategized for future action. Students held a town hall Wednesday to discuss and draft plans to remove controversial visiting scholar Satoshi Kanazawa, an evolutionary psychologist whose work on race and gender has provoked outrage on campus. The town hall was held to facilitate discussion about the effect of Kanazawa’s presence at Northwestern, draft demands to present to University administrators and work on strategies to pressure the University into accepting those demands, said the organizers of the town hall. The students began the event by going through a timeline of Kanazawa’s association with the University — starting with his request to spend his sabbatical in Evanston and extending to the present — before breaking into small groups and discussing the personal impact of the events this past month. Medill first-year Imani Harris said she thought it was important that students, especially black women, talk to one another about how they were affected by having Kanazawa at Northwestern. The initial demands the organizers put forward included Kanazawa’s “immediate removal” and the fulfillment of psychology graduate students’ demands, such as the reform of the process for selecting visiting scholars. Students also reiterated a demand that the University departmentalize the Asian American Studies and Latina and Latino Studies programs. The list was also opened to other students who wanted to add demands, most of which focused on strengthening the vetting process for visiting scholars and demanding accountability from the University — especially after Provost Jonathan Holloway signalled in a December email that Kanazawa would remain at Northwestern despite student concern. In an email obtained by The Daily, Holloway told a student there was “very little” he liked about the situation. However, he added, asking Kanazawa to leave could draw backlash from the larger academic community. One student said that, in the email, Holloway was “really just saying that black lives don’t matter,” a statement that garnered nods and snaps of approval from the rest of the students. Medill sophomore Emma Evans, who also attended the event, reiterated that Kanazawa’s work was not up to par with University standards, and read aloud an email from psychology Prof. Michael Bailey to a graduate student in the department. Though Bailey referred to Kanazawa’s research as “bad and stupid” in the email, he said he didn’t think allowing Kanazawa on campus would disrupt anyone’s experience. But the situation is “bigger” than just Kanazawa, Weinberg junior Anyah Akanni said. By allowing him to stay, she said the University is implicitly supporting his work.